It can take decent photos and also a 1080p video you can share directly to your social media audience. 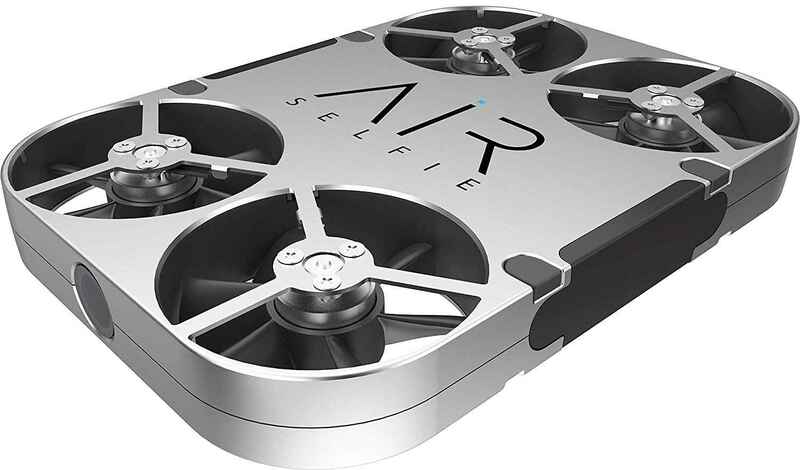 BOTTOM LINE: The AirSelfie drone is an expensive novelty. It can take decent photos and also a 1080p video you can share directly to your social media audience. The main problem is the battery life. Selfie sticks have been a big trend last 2 years, but to be honest, they are annoying. But if you want to take a selfie without the stick from a distance, what would you do? Any idea? What if you have a mini camera which can fly? Nowadays, with so many ingenious crowdfunding projects, this can be a reality. 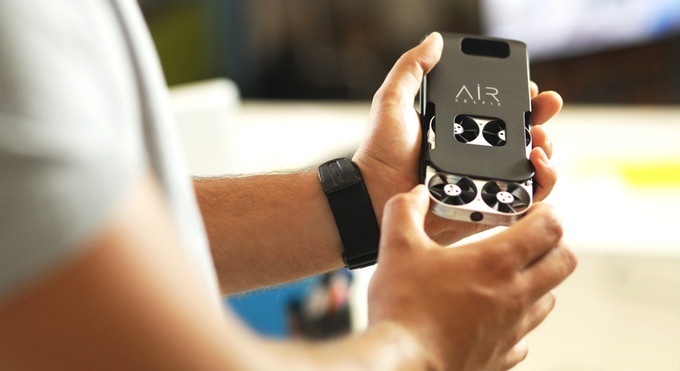 After successful Kickstarter campaign (2,762 backers pledged €574,504) the AirSelfie drone is ready to buy on Amazon. What is AirSelfie drone? In short, it is a portable flying camera integrated into your mobile phone cover. Perhaps a next must-have accessory for selfie lovers. The first thing you should know about the AirSelfie drone is its small size. It is smaller than a standard smartphone and weighs 52 grams. The main idea of AirSelfie is, of course, take the selfies from the air (up to 60 feet above you). The drone is easy-to-use and works great outdoors and indoors. Take the drone out of its cover and launch it from your phone via the AirSelfie app. When the drone is in the air, you can select among three unique flight modes, which are preset to control the device’ movements. 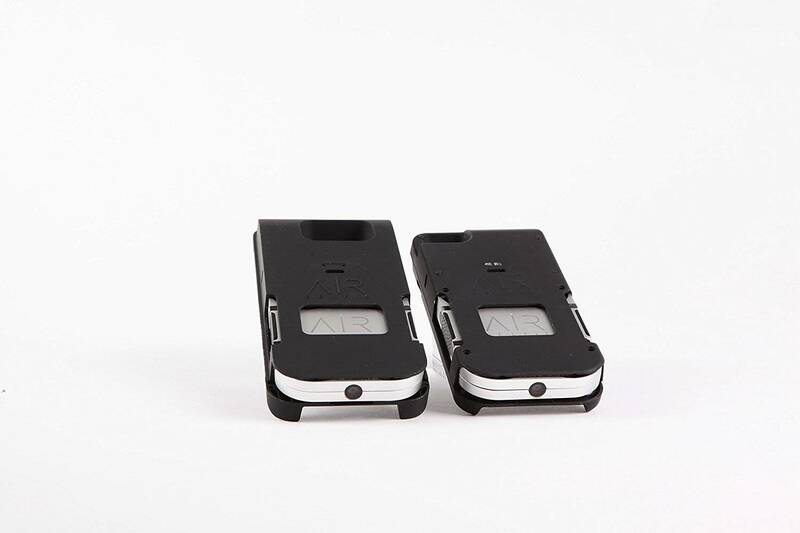 Selfie mode – Two directional buttons make AirSelfie move close or far to you. Selfie Mode Control Mode – Use virtual joystick and control the drone in real time. Flying Mode – Take the perfect photo using the hovering function. This feature allows the drone to stay still in the air for a better shot. Another pretty nice feature of the AirSelfie drone is that it connects with Apple iPhone automatically, thanks to its self-generated WiFi (2.4GHz) network. You can post photos and videos taken with AirSelfie immediately on social media. All photos and videos are automatically sent to the smartphone via WiFi and appear on the app. From there, you can choose which ones to save in the smartphone gallery and then upload to your social networks to start generating likes and shares from your friends and followers. Ok, you’ve got a nice looking drone, it makes selfies from distance, stays still in the air, but the main question is. How’s the camera? This is really the main question because this mini-drone comes in at just $300. The AirSelfie takes very decent five-megapixel snaps, and also 1080p video, with images saved to a MicroSD card. The photos look good, and when you take into the account that you can fly up to 60 feet, and control the shot using a just smartphone to achieve optimal angles, it is not bad. You can even use the 10-second delay timer if you want to be a part of group photo or the burst mode (up to the shots). The AirSelfie drone is an expensive novelty. It can take decent photos and also a 1080p video you can share directly to your social media audience. The main problem is the battery life. The little drone, fully charged, will only fly for about three to five minute after 30 minutes of charging. That can annoy some people. You need to consider purchasing an external power bank from the company. The AirSelfie Power Bank is designed to be integrated with the flying camera and gives you the possibility to charge it up to 20 times before running out of charge. For those who want to take selfies from the distance and hate a selfie stick like us, but don´t like the AirSelfie drone. Here are some alternatives you should see. The Breeze camera captures video in 4K Ultra High Definition, as well as 13-megapixel stills. You do not need any flying experience to take aerial group photos and video. Pick from 5 automated flight modes to get the ideal shot – Selfie, Pilot, Orbit, Journey, Follow Me. Spark mini-drone has all the signature technologies of DJI’s brand, allowing you to seize the moment whenever you feel inspired. With intelligent flight control options, a mechanical gimbal, and a camera with incredible image quality, you can take amazing aerial photos. The AirSelfie drone is an expensive novelty. It is not a gadget for everyone, but the idea of drone designed especially for selfies is interesting.